Lesson 22: Understanding God’s Grace (Part 1) | Grace 4 You Ministries, Inc. 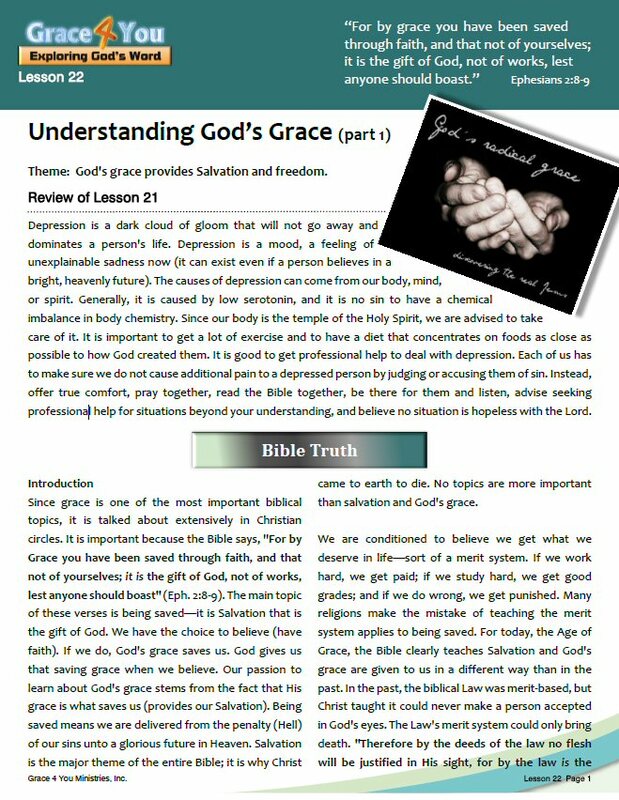 Since grace is one of the most important biblical topics, it is talked about extensively in Christian circles. It is important because the Bible says, “For by Grace you have been saved through faith, and that not of yourselves; it is the gift of God, not of works, lest anyone should boast” (Eph. 2:8-9). The main topic of these verses is being saved—it is Salvation that is the gift of God. We have the choice to believe (have faith). If we do, God’s grace saves us. God gives us that saving grace when we believe. Our passion to learn about God’s grace stems from the fact that His grace is what saves us (provides our Salvation). Being saved means we are delivered from the penalty (Hell) of our sins unto a glorious future in Heaven. Salvation is the major theme of the entire Bible; it is why Christ came to earth to die. No topics are more important than salvation and God’s grace.